After escaping shelling in Damascus and terrifying bloodshed at sea, 14 month-old Palestinian twin girls are now among hundreds of people living in limbo in grimy Egyptian police stations, with no end in sight to their plight. 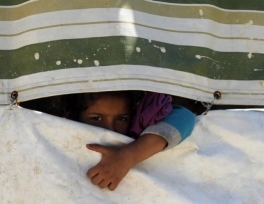 Of the 2 million people who fled Syria's civil war, none may have it worse than Palestinians, who have known no other home than Syria but do not have Syrian citizenship and have therefore been denied even the basic rights secured for other refugees. The United Nations says the Egyptian government has refused it permission to register Palestinians from Syria as refugees and give them the yellow card that allows them to settle. As a result, hundreds of Palestinians civilians have ended up detained in police stations, with no place else to go. The twins' family fled Syria after their house was nearly hit by shelling. But when they arrived in Egypt they were denied permission to work or to receive refugee benefits. After five months, with no other way of obtaining a living, they attempted to leave Egypt for Italy. They were captured at sea on Sept. 17 by the Egyptian navy, which fired on the overloaded rickety craft, the mother of the twins said. She held her daughters tight as bullets flew by. At least one person was hit and the boat was filled with blood and flying shrapnel. "The children were traumatised,"she said. "I was holding my daughter hunched down. The bullets were coming.... There was so much screaming... There was so much blood...."
If the family were Syrian citizens, once detained they would most likely have been permitted to leave Egypt for refugee camps in other countries in the region, says Human Rights Watch. But because they are Palestinians they have been given no other option but to camp out in a police station indefinitely, or somehow make their way back to the war zone in Syria. Turkey and Jordan will not accept Palestinians from Syria and Lebanon will only allow them to pass through for 48 hours. So they live at the four storey police station in Alexandria, where cold winter wind blows in from the sea and families of Palestinians sleep on blankets on cement floors. "The most distressing thing is that these people are only in jail after they tried the most desperate thing they could, which is to get on one of these death boats,"said Tamara Alrifai of Human Rights Watch. "The fact that they were willing to take the risk with children sometimes only as old as one month shows how desperate they were." They receive one meal a day from an aid group. Many pass idle days praying. The sounds of children crying echo through the drafty chambers. All those who spoke to Reuters asked that their names not be used to prevent reprisals by the police. "The conditions are not good for young children,"one detainee said. "It is inhumane to keep them here." Egypt once seemed like the best option for those escaping Syria's civil war. President Mohamed Mursi had welcomed Syrian refugees with open arms. But after the army ousted him in July, public sentiment quickly turned against Syrians, who were accused of backing Mursi's Muslim Brotherhood. Among some 300,000 people who have fled Syria to Egypt are an estimated 5,000 to 6,000 Palestinians, many born in the Yarmouk refugee camp in Damascus, established in 1957, which was nearly destroyed by air strikes earlier this year. The overwhelming majority of the Palestinians have never set foot in the Palestinian territories and have considered Syria their only home. But Egypt refuses to allow the United Nations refugee agency to treat them like other refugees from Syria. "It is the view of the government of Egypt that Palestinians fall outside of UNHCR's mandate,"said Teddy Leposky, a UNHCR spokesman in Cairo. "UNHCR has therefore not been able to provide assistance or advocate effectively on behalf of Palestinian refugees in Egypt." Hundreds caught in Egypt without the proper documents or apprehended trying to leave for other countries have been detained indefinitely without criminal charge, say lawyers representing them. "(Prosecutors) have ordered them released, but national security has ordered them detained until they are deported," said Mahmoud Belal of the Egyptian Centre for Economic and Social Rights. The Egyptian authorities say the Palestinians at police stations are being detained for immigration violations: "Anyone who enters or exits the country outside the law will have it implemented against him," said Interior Ministry spokesman Hany Abdel Latif. "The police are implementing the prosecutor's orders." Foreign ministry spokesman Badr Abdelatty acknowledged that detaining children in police stations indefinitely was not a good solution, but said the government did not have resources for "rehabilitation centres" to accommodate such cases. Those being held are so desperate that they cling to rumours. Recently, detainees in several police stations heard that Sweden had announced it would resettle 200 Palestinian Syrians currently detained in Egypt. "You can't imagine the joy we felt when we heard that,"a 52-year-old detained in Alexandria said before being informed there was no such plan. Despite the hardship, many said going back to Syria would be even worse than remaining camped out in detention. "I cannot travel anywhere except for Syria, where there is death and destruction,"said a man in his thirties arrested trying to flee Egypt by boat to Europe. He said he was from Ghouta, the neighbourhood where a Sarin gas attack killed hundreds of people in September. For those Palestinians from Syria who have not been detained, life in Egypt is still full of uncertainty. They live in fear that they will be stopped by the police without the proper documents, unable to seek protection from the Syrian embassy, the United Nations or the Egyptian authorities. Wessim, 37, fled the Yarmouk camp in Damascus and now lives in a cramped apartment with his family in Alexandria. He too wants to leave Egypt. "I would have tried (to leave by boat) if I had the money,"he said, sitting with his five-year-old son at a cafe near the perfume shop where he is working for free for a relative in exchange for being allowed to stay in his flat. The mother of the twin girls at the police station said she had no regrets over attempting to flee Egypt, despite the trauma her family experienced at sea and the hardship of being held in detention ever since. "We were running away from death," said the mother. "We said to ourselves, 'We might die anyway', but at least we had some hope for something when we got on the boat." Chemical weapons debates: How to destroy it?